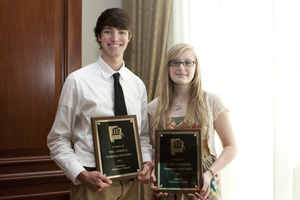 Will Sorrell of Birmingham and Claire Oldfather of Madison were named outstanding male and female students at 2011 Alabama Governor’s School. The two-week honors program for rising high school seniors concluded Friday, July 1, at Samford University. Sorrell and Oldfather were chosen by AGS students, faculty and staff on the basis of participation and overall interest shown during the session. This year’s AGS included 80 students from high schools in 23 counties. Sorrell, a student at Briarwood Christian School, is the son of Vicki and Casey Sorrell. Oldfather, who attends Providence Classical School, is the daughter of Dana Oldfather and the late Duane Oldfather. AGS participants received college level experience in academics, creativity and leadership. In addition to classroom study, they also enjoyed a Birmingham Barons baseball game, a visit to American Village, a service project at a Shelby County cemetery, and many campus recreational activities.